A pure and refreshing beverage made from aloe vera that helps maintain general well-being. 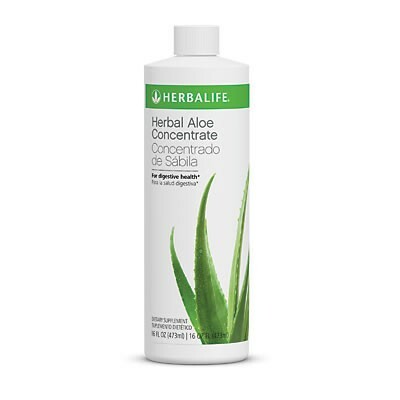 Herbal Aloe Concentrate Mix is made from aloe plant with contains natural enzymes, vitamins, minerals and amino acids. Made from aloe vera and contains enzymes and vitamins. Includes the calming benefits of chamomile. A positive and refreshing way to ensure you maintain an adequate level of water consumption. Consider replacing soft-drink with Herbal Aloe Concentrate Mix to help you minimise your intake of sugar. Enjoy as a supplement to your daily diet. Mix 3 capfuls (15 ml) with 120 ml (4 fl.oz.) water and drink 1 to 2 times per day. To prepare 1 litre of ready to consume drink, mix 1/2 cup (120 ml) concentrate with 1 litre water. Refrigerate any unused portion.